Before an enthusiastic crowd of more than 30,000 supporters, Tsai Ing-wen (蔡英文) declared victory in her trademark matter-of-fact, straightforward manner. 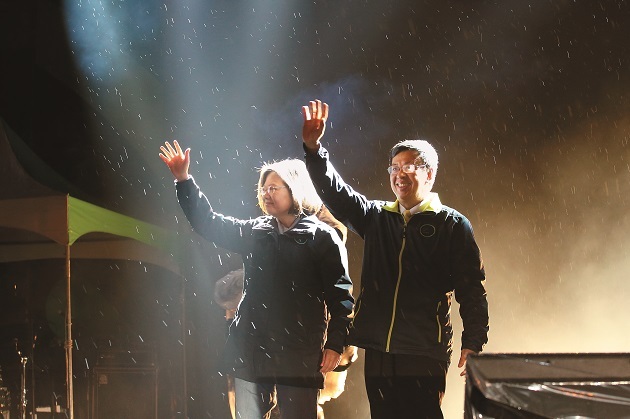 She had just been elected the first female president of the Republic of China with a commanding lead of more than 300,000 votes over her main rival, Eric Chu (朱立倫) of the ruling Kuomintang (KMT), leaving James Soong (宋楚瑜) from the People First Party (PFP) in a distant third place. Datiche Nicolas, a photographer with French agency Sipa Press, who has documented presidential elections in many countries, called Tsai's road to victory "relaxed" because she had smoothly increased her initial lead in the presidential race, continuously pulling away from her two challengers throughout the election campaign. Though Tsai's resounding victory might not be welcomed by China, it is a dream come true for many people in Taiwan and the Asia-Pacific region. Tsai will not only be the first female president in the Chinese-speaking world, she will also be the first woman politician in Asia to become a national leader in her own right. Tsai does not hail from an influential political clan, nor is she carrying on the political struggle of a jailed or assassinated husband or father. "She has taken the gender hurdle so easily," says Huang Ching-lung (黃清龍), editor-in-chief of the Want China Times (旺報), hardly veiling his admiration. Huang thinks that pairing the steely Tsai with "soft guy" Chen Chien-jen (陳建仁) as her running mate has turned the gender stereotypes of traditional politics on their head. Taiwan, as a young democracy, has reached in one go what even the older democracies of the West such as the United States are unlikely to achieve, Huang believes, adding that this will serve as a great encouragement for Taiwan's Asian neighbors. Equally important is that Taiwan has completed its third change of government with the January 16 elections. Tsai, a law professor who only joined the DPP in 2004, was still very much a newbie to party politics when she took the helm of a desolate, bruised party in May 2008, following humiliating defeats in the presidential election and general elections earlier that year. Tsai pulled the divided party together and transformed it for a triumphant comeback, not only wresting back government power but also ending the KMT's decades-long majority in the Legislature. Calls for "change" figured prominently in Tsai's election campaign. Now that the voters have voted for change, the KMT's monopoly on power has come to an end. 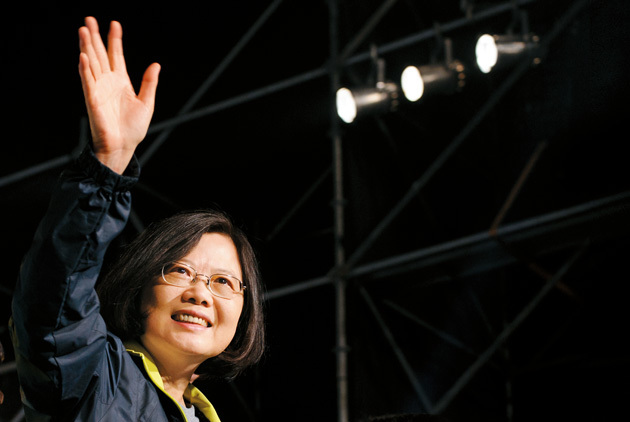 Tsai will not have much time to bask in her victory, however, as she faces formidable challenges. Tsai has a strong mandate and a solid majority in the Legislature, but she needs to rebuild the government's executive power, its political leadership and ability to communicate with China. These three abilities will be put to the test as she faces unprecedented challenges. The DPP’s candidate team for the presidential race, the resolute Tsai Ing-wen and affable running mate Chen Chien-jen, have turned gender stereotypes topside down. Tsai will assume office as the island's economy is on a downward trajectory. The economy is effectively shrinking, exports continue to weaken, and one third of Taiwan's salaried workers make less than NT$30,000 per month. The rise of the red supply chain – the popularly used term for import substitution in China – has dealt a severe blow to Taiwan's export-oriented industries. Taiwan's deep economic malaise stands in stark contrast to Tsai's declared goal of "rebuilding the Taiwanese people's dignity and pride." Tsai must immediately demonstrate the government's execution abilities in addressing hot potato issues such as how to amicably interact and maintain good economic and commercial relations with China while carrying out the island's economic transformation. "It will be interesting to see how sovereignty and dignity, economic development and social integration rank in terms of priorities in the Tsai era," says Ding Shuh-fan (丁樹範), head of the Institute of International Relations at National Chengchi University. Ding says that Tsai has been reiterating that she will safeguard national sovereignty. However, some 40 percent of Taiwanese exports go to China. If Tsai sacrifices economic growth [for greater sovereignty], the island's trade balance will immediately run into a deficit, which will only aggravate the current economic woes. Moreover, the major issues causing tension in cross-strait trade do not lie with China but with Taiwan, says Liu Po-ting (劉柏定), assistant researcher at the Chung-hua Institution for Economic Research. With the rise of the Chinese economy, China is less dependent on Taiwan. Rather, Taiwan now needs to further open up its market to China, even though this faces strong resistance from the public. This contradictory attitude can be attributed to the fact that the people do not have confidence in the government's execution abilities, Liu says. "Unless it pertains to national security, (concerns about) Chinese investment is actually a 'fake issue'," says Liu. "If the ultimate reason why the people oppose lifting restrictions on Chinese investment in Taiwan is a lack of confidence in the government's ability to control it, then Tsai must demonstrate good governance, instilling the people with confidence that strictly executed opening is safer than not opening at all, which would only create more unregulated, under-the-table trade." At an international press conference following her election victory, Tsai emphasized that her foremost task as president is uniting the nation. 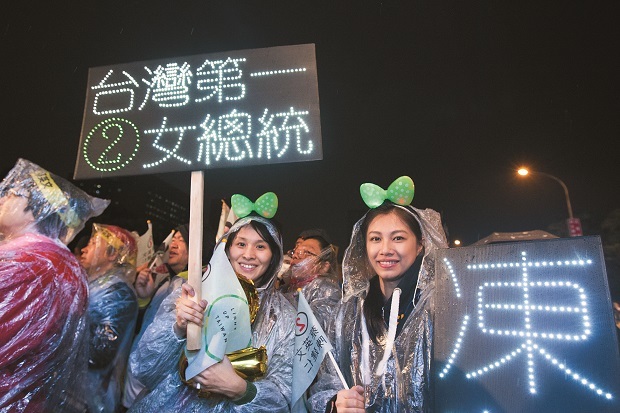 These appeals for unity stand in stark contrast to the upsurge in Taiwanese consciousness during the election campaign and the vicious struggles between the political parties in the past. Chu Chin-peng (朱景鵬), professor at the Department of Public Administration of National Dong Hwa University, says that major policy controversies over the past eight years concerning issues such as electricity prices, minimum wages and the future of the petrochemical industry were caused by strong opposition from the DPP to government plans. Chu says that while the KMT administration only continued policies designed during the previous DPP administrations, the DPP "steadfastly opposed what it had aggressively pursued back then [when it was in power]." Given that social forces and Taiwanese identity had a prominent place in the just concluded elections, Tsai, who has pledged to properly communicate her ideas and use open and transparent policymaking, will very likely convene a national affairs conference to address these highly controversial issues, Chu predicts. But such a conference would be more of a pro forma way of communicating, unable to actually resolve confrontations or thorny issues. The challenges to Tsai's political leadership will also come from within her own party when the various factions demand their share of power or clash over the party's future course. Yuichiro Masumitsu, staff writer with Japanese daily Asahi Shimbun (朝日新聞), says his impression is that the policies that Tsai proposed during her campaign were quite conservative in comparison to some rather radical public opinion. She gave people the feeling that she would do her best to maintain stability and not to make any rash moves. When the new Legislative session begins in February, lawmakers will first elect a speaker and vice speaker. Tsai will have to decide personnel matters before taking over the administration from the KMT. All this will whet the appetite of the various DPP factions. "I'd guess that those forces and voices within the DPP that advocate independence will give her a lot of trouble should they disagree with the policies of the new administration," predicts Masumitsu. Tsai will face her toughest challenge when it comes to finding a new model for interaction with China. Beijing, in particular, is closely watching what direction Tsai will take cross-strait relations. What are the core qualities of bilateral relations? This will put to test Tsai's ability to communicate, especially after China showed a great measure of goodwill with the Ma-Xi Meeting late last year and then chose to show as much ill will on the eve of the elections in what has become known as the Chou Tzu-yu (周子瑜) Incident. Chou's case is a good example illustrating popular sentiment when it comes to national identity. The 16-year-old singer from southern Taiwan drew fire in the Chinese internet for waving a small Republic of China flag on a Korean TV show. Just before the elections, Chou was forced by her management to apologize and to profess in a videotaped message that "there is only one China,"and "I'm proud to be Chinese." Although Chinese scholars have tried to play down the whole affair as an "accidental campaign" by "populist" Chinese internet users, people in Taiwan were outraged at Chou's public humiliation. Speculation was rife among cross-strait observers that China used Chou to sound a preemptive warning and draw its "red line" for cross-strait relations. "Elections for Taiwan's president have been held for the last 20 years. China is very much aware of the explosive power of 'exploitable popular sentiment'," remarks Wang Li-ben (王立本), adjunct assistant professor at the Department of Humanities and Social Sciences of National Taiwan University of Science and Technology. By taking action at a time when it should have refrained from doing so, China probably wanted to use the Chou Tzuyu incident to convey the message that there is no room for ambivalence in cross-strait relations in the future, Wang says. "Taiwanese who do not recognize the 1992 Consensus but still want to develop in China will not find it a bed of roses." However, a cross-strait advisor on whom outgoing President Ma Ying-jeou heavily relied has a different point of view. The worrisome side of the whole incident, he believes, is that it probably shows the Chinese Communist Party leadership is not speaking with one voice when it comes to Taiwan. Particularly critical voices from the Global Times (環球時報), a Chinese tabloid backed by the military, triggered speculation whether Chinese President Xi Jinping had angered the military with his sweeping reforms in the People's Liberation Army. These observations indicate that the situation is currently very murky. Nobody seems entirely sure just who is in charge in China when it comes to cross-strait policy, or who played the leading role in recent months in arranging the surprise meeting between Ma and Xi and subsequently deciding Taiwan-friendly policies. One cross-strait expert who does not wish to be named notes, "Aside from Liu He (劉鶴), whom Xi personally put in charge of finance and economics, Secretary-General Xi Jinping seems to make all decisions by himself." This treacherous situation, the uncertainties about with whom to engage in dialogue, is clearly a challenge for Tsai, even though she prides herself on her negotiating skills. Can cross-strait exchanges be extricated from the longstanding pattern of "Who has more bargaining chips? Who has time on their side?" The time between her election and her inauguration on May 20 will become an important testing period for Tsai. She will have to prove that she can create a new pattern for cross-strait ties. Despite the daunting tasks lying ahead of Taiwan's first female president, many people are quite confident that she will be able to realize the "Taiwanese dream" they have in their hearts and heads. Such confidence is based on the idea that Tsai not only has Washington's backing, she is also a strategic thinker who focuses on getting the job done instead of grandstanding and seeking the media limelight. Under Tsai’s leadership, the DPP began to transform itself. One veteran journalist says that while Beijing continues to be highly suspicious of Tsai's ideological stance, Washington signaled toward the end of her campaign that she had passed the test. Encouraging public statements and high-level U.S. officials traveling to both sides of the Taiwan Strait in a bid to facilitate cross-strait communication shows that the U.S. is preparing to play a mediator role when the time is ripe, the journalist says. "China is very much on alert when it comes to Tsai; they identified her as an 'idealistic Taiwanese independence supporter' very early on. This is a much harsher assessment than the 'opportunist' label that they gave Chen Shui-bian (陳水扁)," the journalist says. Washington has therefore been urging Beijing to observe Tsai a little longer instead of rushing to conclusions. David Brown, adjunct professor of China studies at the School of Advanced International Studies of Johns Hopkins University, says the assumption is that the United States will definitely see to it that Taiwan does not walk in a different direction, but the United States will also remind both sides of the Taiwan Strait that they must be calm and composed. In the face of these challenges, Tsai's advantages are her steely determination and strategic way of thinking. Chen Chun-lin (陳俊麟), a veteran Tsai aide and the director of the DPP's polling center, says Tsai differs from the typical Taiwanese politician in that she does not like to use incendiary language or fan public sentiment to mobilize support. Tsai prefers cool-headed reasoning and policy discussion. On the political stage, she will therefore never have the infectious rock star charisma of some other politicians. "In the nine-in-one elections in 2014, Ko Wen-je (柯文哲) won the Taipei City mayorship, while Tsai led the DPP to win 13 counties and cities. The difference between the two is that Ko is field commander material, whereas Tsai fits the bill of commander in chief," Chen says. Should Tsai be able to pool enough talent, she will definitely be able to achieve sweeping reforms and far-reaching transformations of Taiwanese politics, the economy and society. "She has the ability and the ambition to shape a different political system," Chu Yun-han (朱雲漢), distinguished research fellow at the Institute of Political Science of Academia Sinica, says. But he also cautions against excessive optimism: "The problem is that her window of opportunity is limited to this one year ahead."